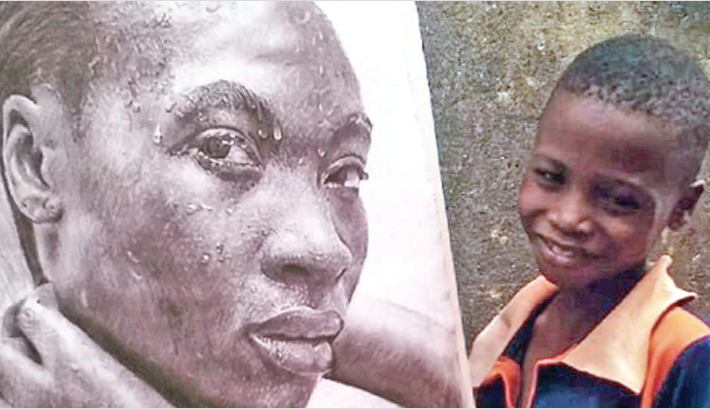 Some artists spend decades honing their skills before even tackling hyper realistic art, but 11-year-old Kareem Waris Olamilekan is already a professional artist with some stunning hyper realistic artworks in his portfolio. Kareem, who hails from Lagos, Nigeria, started expressing his artistic talents when he was around six years old, by drawing his favourite cartoon characters. His big break however, occurred two years later, when he and his family moved houses and he discovered the Ayowole Art Vocational Academy. His talent for drawing was evident, and despite facing great financial difficulties and struggling to buy basic artistic supplies, the young boy managed to improve his skills to the point where he is now able to draw detailed photo-like drawings. Teachers at the academy quickly noticed his talent and asked him to join. Now, Adeniyi Adewole, a graduate general arts student and the founder of the academy, says Kareem is one of his best students. Kareem Waris Olamilekan is being hailed as Nigeria’s youngest professional artist, and already boasts an impressive 27,000 fans on Instagram alone, but his success did not come easy. He recalls secretly buying 20 sheets of paper every time his mom would send him shopping for food, so he could have something to draw on, and using a flashlight in the middle of the night, because his home had no electricity. The young artist’s works are drawing attention not only for their incredible detail, but also for their mature inspiration. For example, Olamilekan’s most famous drawing, ‘Daily Bread’, was inspired by his family’s struggle to put food on the table. Kareem hopes to one day become as good and as famous as Arinze Stanley, a fellow Nigerian artist and one of the world’s most talented hyperrealists.